My daughter's wedding was a garden wedding. There were several things to consider because of the lack of electricity and water. 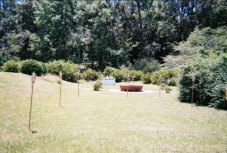 The garden itself was beautiful and the flowers were in bloom, which in itself, saved lots of money on buying flowers. 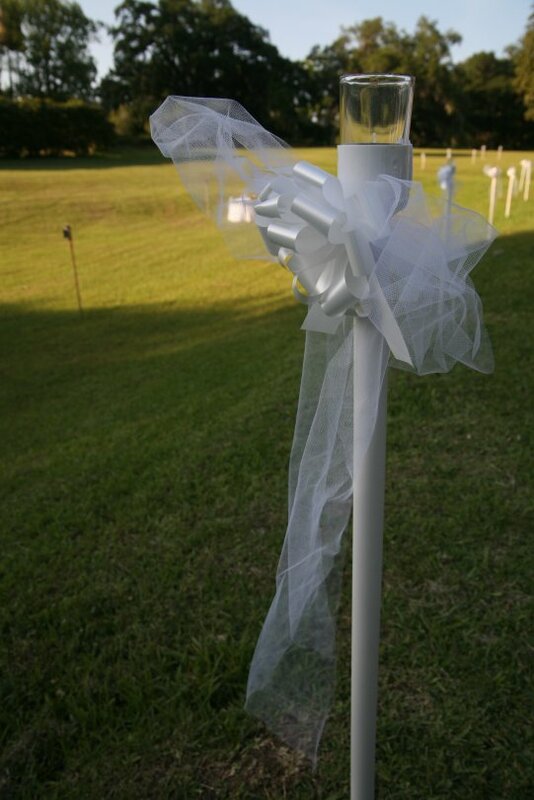 We had to put a lot of thought into the lighting of the area, because the wedding was to be at sunset and the reception at night with no lighting in the garden. Only one extension cord was available and that was to be used for the sound system. We did manage to put the sound system and one large light on the cord which helped a great deal in the area where the cake table and the dance area was set up. Lots of candles lined every path and every area the guests were in. I think it was around three hundred in all. Some on homemade candle holders. Some in mason jars with red ribbon tied around the mouth to hang in trees and set in strategic places. The final touch was eight torches for the dance area. We had two tents set up; one for food and one for my daughter to change in. 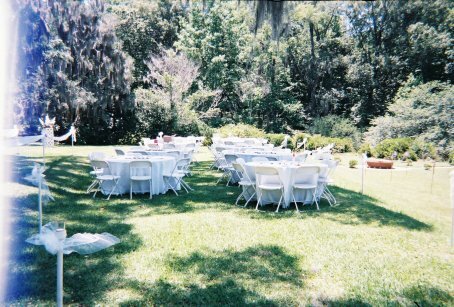 For seating we rented round tables that sat eight guests, the white linens and the chairs from a local party shop. 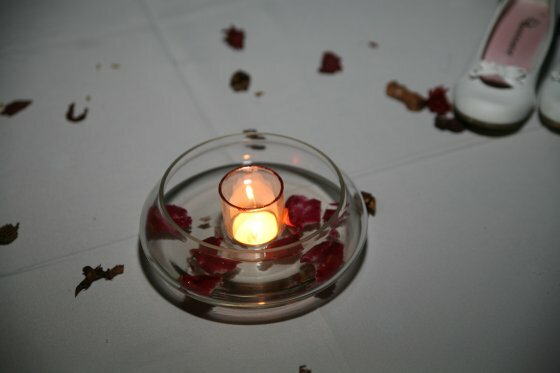 The table was set with a glass bowl with a candle in the center and some rose petals floating in water and scattered around the center of the table. The look of fallen petals seems perfect for a garden wedding. 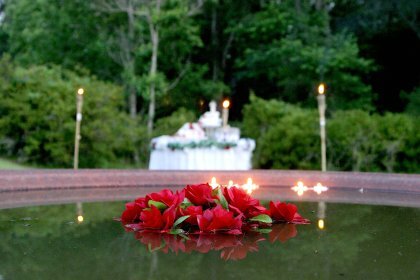 There was a water trough near the cake table so we floated a few more candles and some red roses there too. It looked beautiful in the sunset! We made: fans for the tables with pictures of the couple, some when they were children and others their engagement picture. 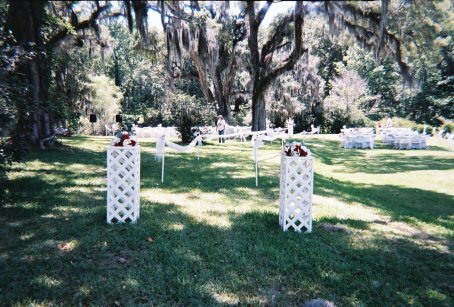 Using materials from our local hardware store and Hobby Lobby, we made pedestals for some flower arrangements at the ends of the isle, all the candle holders, the flower bouquets and arrangements. You may find some of your supplies here or perhaps here. 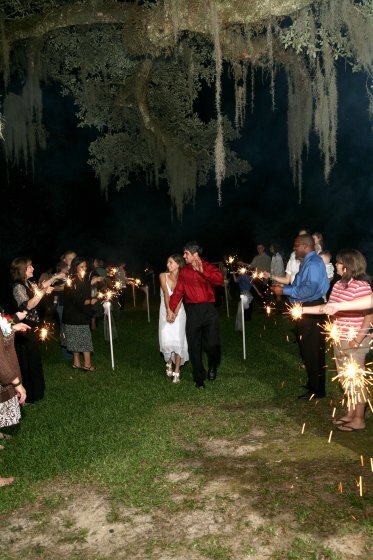 At the end of the night, they walked out between a trail of sparklers. These were sparklers that burned for a much longer time than the ones you may have burned at a fireworks event. 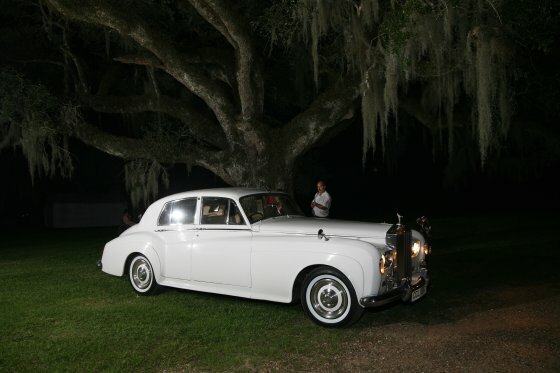 The antique Rolls Royce they drove away in was part of the tuxedo package. We had rented the garden for the whole day and so set up that morning. It took lots of family and friends to set it all up, but by 11 AM we were ready. The wedding was at 6 PM so we had plenty of time for relaxing and getting dressed. 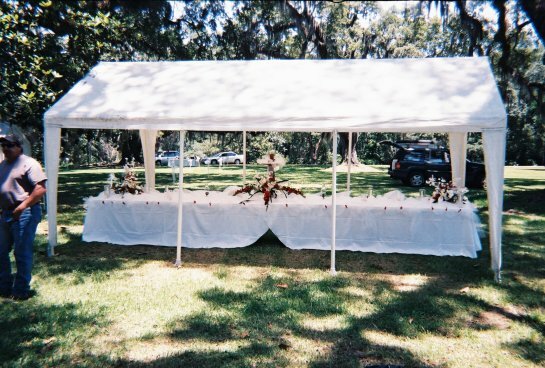 So you want to know how much this garden wedding cost? It was around $6000 for EVERYTHING, except the honeymoon, including her wedding dress and her dress for the reception. Our daughter had her dream wedding, we stayed within budget and we didn't have to break the bank.